How to buy the best shower - Which? Having a rubbish shower is a pretty miserable experience, as you huddle under a trickle of warm water before being frozen to the bone when someone turns on a tap nearby. That’s why if you’re refitting your bathroom, or creating a new en-suite, you need to make sure that you buy a great shower that you’ll be happy to use every day. This guide will help you make the right choice. If you already know what you're looking for, head straight to our electric shower reviews. What type of water system do I have? When buying a new shower, the first thing you need to consider is the type of water system you have in your house. This will affect the models you can choose. Any water system will work with an electric shower, but for mixer showers, which rely on readily available hot water supply, you’ll be more limited. If you have a combination (combi) boiler then you have a high-pressure vented water system. In this system your combi boiler, usually located in your kitchen, heats cold water from the cold mains supply as soon as you turn on the shower, removing the need for a storage tank. If you have a hot-water tank but no cold water tank then you have a high-pressure unvented water system. Water is stored in the strengthened hot-water tank, often situated in an airing cupboard, and is then heated by either immersion heaters or by a central heating boiler. Both these systems deliver water at mains pressure and are well suited to mixer or digital showers. If you have a cold-water tank (normally in your loft) and a separate hot-water tank (normally in your airing cupboard) then you have a low-pressure gravity system. The water pressure in this system is generated by gravity and is dependent upon the distance the water drops from the cold-water tank. So, if there’s little distance between your shower and your water tank then you’ll get low water pressure. This system is usually best suited to power or electric showers, though if you have good enough water pressure then you could use a mixer shower. If you don’t have access to any hot water – as may be the case in an outbuilding – or if there’s only a limited amount, then you’ll rely on the cold mains supply. In this case you need an electric shower. Choose the right type of shower with our choosing tool below. Is there access to a hot water supply in the room where you want your shower? Do you have a gravity fed heating system? Do you want the latest, advanced features? In an electric shower, cold water from the mains flows into the unit and is heated by an element – just like the element in a kettle. Once the water gets to the right temperature (depending on the heat setting you’ve selected) it’s pushed through the shower head. When choosing an electric shower you need to consider its kilowatt (kW) rating. These range from around 7kW to 10.5kW and in general, the higher the rating, the more powerful your shower will be (though you may notice a drop in winter, when the colder water takes longer to heat up). Is the water pressure in your home adequate? 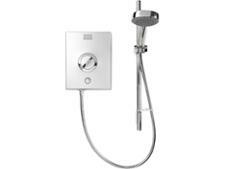 Shower manufacturer Triton recommends a minimum pressure of 1 bar for a 7kW shower, rising to 1.5 bar for a 10.5kW model. Can your electrics handle the amount of power? Triton recommends a 32A fuse or circuit breaker for a 7kW shower, rising to 45A for a 10.5kW model. Is the electric cable running to the shower big enough? Triton recommends a 6mm cable for a 7kW shower, increasing to 10mm for a 10.5kW model. We’ve tested a range of the latest electric showers from big brands such as Aqualisa, Mira and Triton. To see which topped our tests, check out our Best Buy electric showers. Who are electric showers suitable for? Anyone can have an electric shower installed, as they use cold mains water and aren’t affected by the type of water system you have in your home. Because they generate their own hot water they’re usually the shower of choice for households where hot water created by the boiler is in short supply. But their use isn’t limited to this sort of set up. Even if you have a high-pressure system that delivers plenty of hot water, an electric shower could still be of interest, especially if you’re creating a new bathroom. That’s because it’s often much easier – and cheaper – to connect a new shower to the existing cold-water supply rather than rerouting hot water pipes. A small number of electric showers even include their own pump to boost the water pressure. These are expensive but can offer a solution if you have a low flow rate in your home. Why choose an electric shower? As well as being relatively easy to install – though we’d always recommend using a qualified trader for this – they’re also economical to run, as they only heat the water you’re going to use. They generate their own hot water, so they’re ready to use around the clock – you don’t have to worry about switching the hot water on half an hour before you want a shower. Because they have their own internal heating element, they’ll still work even if your boiler is on the blink. What are the drawbacks of an electric shower? Although they can be used in high-pressure systems, you’ll usually get a higher flow rate from a mixer shower if you have this sort of set up at home. If you live in a hard water area then their heating elements can be affected by limescale (in the same way that it can affect the element of your kettle). The main body of the units themselves aren’t usually particularly stylish, especially on cheaper models, while the need to incorporate a heating element means they’re bulkier than more discrete mixer showers. 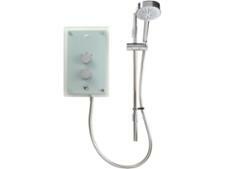 A mixer shower blends supplied hot and cold water to the desired temperature and delivers it through the shower head. They’re available in a number of styles, but the most common are shown in the table below. Single lever – as the name suggests, this has one lever that you pull out to turn on and control the flow and turn to adjust the temperature. This can be built in or left exposed on your wall. Rotary or sequential – a single wheel that you turn to activate the shower and control the temperature (you can’t adjust the flow). Again, available as a built-in or exposed option. Concentric – comprises an outer wheel to turn on and control the flow and an inner one to adjust the temperature. Available as a built-in or exposed option. Dual controls – has separate control dials to control the temperature and the flow (the latter can sometimes divert some of the water to a second shower head or the bath tap). Usually only available built in. Bar mixers – comprise a bar, either vertical or horizontal, with dials at either end to control the temperature and flow (again, sometimes with divert options). Bar mixers have to be exposed. Concentric, dual and bar mixer controls enable you to leave the temperature at your preferred level when you’ve finished showering; single lever and rotary do not. Find out what shower owners really think of big brands, including Aqualisa, Mira and Triton in our guide to the best mixer shower brands. Who are mixer showers suitable for? Mixer showers typically work with any plumbing setup provided there is a hot water supply. Some are specifically designed for high or low-pressure water systems – make sure you check the model you’re interested in before buying. Mixer showers are more modern in design and tend to offer more advanced functions than electric showers (including digital options). They’re also more attractive, as there is no need for an unsightly plastic box containing the heating element and controls. If you have a high-pressure system, they’ll typically give you a higher flow rate than an electric model. What are the drawbacks of a mixer shower? Mixer showers don’t have their own pump, so won’t increase the flow of water to the shower. So if you have a weak water flow from your taps, the same will go for your shower. If that sounds like your house then you’d probably be better off with a power shower. They also rely on an external hot water supply, so if your boiler is slow to heat up, your shower will be too. And if your boiler breaks, you’ll be left without a hot shower. If you’ve got an unreliable boiler then it may be worth investing in a new model. Read our guide to the best boiler brands to discover which you should choose. Power showers work in the same way as mixer showers in that they combine water from both the cold and hot water supplies. However, where they differ is that they contain a pump to boost the flow of water through the shower head. This makes them a popular option in homes with low-pressure systems. There are two types of internal shower pumps, plastic and brass. Plastic pumps are cheaper but can be noisier and are unlikely to last as long. Who are power showers suitable for? Power showers are ideal if you have a low-pressure gravity system. They should not be used with a high-pressure system (either vented or unvented). Why choose a power shower? For one reason only – to boost the flow rate in your shower if you have low water pressure in your house. This can transform your showering experience, as you get to enjoy an invigorating blast of hot water rather than a meagre trickle. What are the drawbacks of a power shower? Power showers are more expensive than electric or mixer showers and use a lot more water. As well as being bad for the environment, if you have a water meter you’ll notice the impact on your water bill. They also use more energy than other types of shower because they have to heat more water during the course of each shower. This means your energy bills will be higher, too. Discover which power shower brand is built to last in our guide to the best power shower brands. Feedback from our latest customer survey found that an exceptional 90% of its showers were still fault-free after eight years use. Digital showers are the latest innovation in shower design, offering features such as precise temperature settings and wireless control units that can be installed elsewhere in your bathroom. They work in a similar way to mixer and power showers, taking water from your hot and cold water feeds. But whereas traditional showers require you to manually adjust the temperature, a digital shower lets you accurately set it using the wireless controls. Who are digital showers suitable for? As long as you have access to a hot water feed then you can install a digital shower – you can’t yet get a digital electric shower. You will need to consider the water system you have in your house, as some digital showers are designed for low pressure/gravity systems (and often include a pump – effectively making them digital power showers) and others are designed for high-pressure systems (digital mixer showers). Why choose a digital shower? Digital showers look modern and offer a number of novel features that, while not essential, can be handy. Many models offer a range of presets so everyone in the house can save their favourite temperature and flow rates, all accurately displayed on an LED screen – there’s no need to reach in to see if it’s hot enough. Some even have remote controls, so you can turn them on before getting out of bed, while others include smart apps that let you track usage. And unlike with a normal mixer shower, you can locate the digital mixer unit (the part that combines the hot and cold water feeds) separately from the shower itself. This means you can hide it away, giving you a sleeker, minimal look in your bathroom and making it easier and less disruptive for your plumber to install. What are the drawbacks of a digital shower? Digital showers are more expensive than standard mixer or power showers. In our latest customer survey we found that they were less reliable than more traditional units – the more advanced technology means that there’s more that can go wrong. Interested in switching to a digital shower? See what real customers had to say about them, and discover which brands impressed, in our guide to the best digital showers brands. What shower features are important? While showers are generally fairly simple devices, manufacturers are constantly revising them and adding new features – especially on more expensive models. Here are some of the key features to look out for. Thermostatic protection – a thermostatic shower is designed to keep the temperature steady to within a couple of degrees, so they should prevent it from turning painfully hot and then numbingly cold if the mains water is used elsewhere in your home. Automatic shutdown – a safety feature that turns off the shower should either the hot or cold water supplies fail. Maximum temperature – another safety feature that prevents the shower being manually turned too hot (useful for families with fairly young children). Limescale protection – different manufacturers offer their own solutions to limescale. Typically it’s handled through a phased shutdown in which increasingly cool water is run through the shower once you’ve finished using it. Limescale is a particular problem for electric showers as they have their own heating element which can get furred up and is hard to access. Multiple heads / diverters – some showers combine a main large head with a small, manoeuvrable one that can be useful if you’ve got small children or pets to wash. A diverter valve allows you to switch the water flow from one head to the other depending on your need. Flow and spray options – even the most basic shower will typically let you choose from a limited number of power and spray settings. Spend more and you’ll get more choice, such as eco options that reduce the amount of water used and ‘boost’ features that aerate the water stream to increase the flow rate. How much do showers cost to buy and to fit? There’s a huge range of showers available to buy and prices can vary wildly. In general, electric and mixer showers are the cheapest, then power showers, while digital showers are the most expensive. Adding features will bump up the price, so a top of the range electric model with a built-in pump and thermostatic protection will cost more than an entry-level power shower. As well as buying a new shower you’ll usually need to pay a qualified tradesperson to install it. The cost to do this will vary in relation to the complexity of the installation and may depend on where you live in the UK. But as a guide, online bathroom retailer VictoriaPlum.com estimates that it could cost as little as £100 for a simple like for like replacement or between £100 and £400 for a brand new installation. You can find skilled tradespeople to fit your shower through Which? Trusted Traders. If you’re replacing an existing electric shower with a similar unit then you may be able to do this yourself (as long as you’re reasonably confident at DIY tasks). Read our electric shower installation guide for more information. Renovating your bathroom is a big job that can cost thousands of pounds. Ensure you spend your money wisely by reading our guide to the best and worst bathroom brands. We reveal the companies that offer the best customer service and fantastic value for money – all based on a huge survey of almost 4,000 Which? members. You can also find out what these recent customers had to say about the quality of the brand’s supplied bathroom furniture and how they rated it for the bathroom installation service they provided.